If you’re like me, podcasts have taken as the audio choice when driving (and even when not). There are a lot of options, but there’s been a void on Tuesday mornings since mid-December. That’s when Joe Pulizzi (@JoePulizzi) and Robert Rose (@Robert_Rose) ended This Old Marketing. That was my #1 can’t-miss podcast each week, and hopefully they'll be back in some way at some point. That said, it seems like a good time to update my list of top marketing podcasts that are in my regular rotation. Check these out to see which may fill the gap you’re feeling too. But first, a few updated podcast stats courtesy of the Podcast Consumer 2018 report by Edison Research. Podcast awareness has increased to 64%. Listeners of a podcast in the last month increased to 26% (24% in 2017). 33% of podcast listeners average more than five hours of listening per week. 31% listen to six or more podcasts per week. 48% listen to podcasts at home most often vs. 26% in the car and 12% at work. Ok, here’s what you’re really here for…20 of the best podcasts for content marketers in no particular order. I’m starting here because these two Jays are quickly building their own networks: Jay Baer (@JayBaer) and Jay Acunzo (@JayAcunzo). 1. 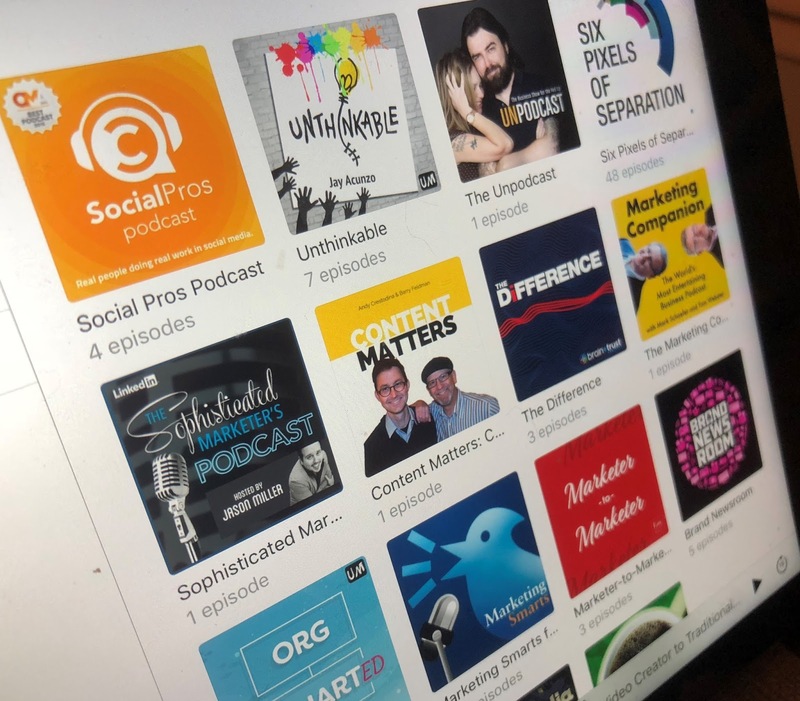 Social Pros Podcast: Real People Doing Real Workin Social Media: Jay and Adam Brown (@Adamcb) continue to lead the podcast pack. Recently surpassing the 300-episode milestone, they talk with social media professionals from companies like Buzzsumo, Coca-Cola and Patron Tequila. You'll learn how they built their programs and how they continue to measure and improve. 2. The Content Experience Show: Randy Frisch (@RandyFrisch) and Anna Hrach (@Annabananahrach) interview top content marketers to learn their approach to strategy, operations and measurement, and how they turn content into an experience. 3. Experience This! : Joey Coleman (@thejoeycoleman) and Dan Gingiss (@dgingiss) focus on excellent customer service stories through segments highlighting customer experiences. 4. Unthinkable: Described as "the show for craft-driven content creators," it's a show to inspire us to avoid shortcuts and hacks and do what we love most: create content! 5. The Maker Channel: What if you could find out what your audience likes about your podcast and what they don’t before actually launching it? That’s Jay’s purpose with The Maker Channel. Test your concept and get that will you shape your show. 6. Org Uncharted: Presented by Tettra, Jay interviews marketers that go beyond their company’s org charts to offer impactful marketing programs. 7. The Difference: Brain+Trust Partners co-hosts this podcast with Jay to uncover the missions, processes and strategies that make the difference between brands that are successful and those that aren’t. These podcasts feature many of the top names and thought leaders in content marketing. 8. UnPodcast: The Business Podcast for the Fed-Up: Scott Stratten (@unmarketing) and Alison Kramer (@UnAlison) discuss how to succeed by showing us what NOT to do, as only they can. 9. The Marketing Companion Podcast: Mark Schaefer (@markwschaefer) and Tom Webster (@Webby2001) offer their fun, unique insights on content marketing's biggest trends and news. They claim to the “most entertaining marketing podcast”, and they just might be right! 10. The Sophisticated Marketer’s Podcast: Jason Miller (@jasonmillerCA) turns his podcast up to 11! You'll learn how to apply content marketing for B2B companies with plenty of rock and roll references and even a few rock star guests. 11. Six Pixels of Separation: Mitch Joel (@mitchjoel) offers his thought-provoking perspective on digital marketing through candid discussions with his guests. 12. Marketer-to-Marketer: Eavesdrop on today’s most influential marketers discussing hot topics in content marketing. These one-on-one conversations were recorded during Content Marketing World in 2017 (at least the episodes released so far). 13. Content Matters: Make your content marketing more effective with Andy Crestodina (@Crestodina) and Barry Feldman (@FeldmanCreative). Besides focusing on a specific tactic, each episode includes their "Mousetraps and Cheese" tips. The "cheese" is what attracts customers to your website. Your website is the "mousetrap" where you convert them. 14. Marketing Smarts: Kerry O’Shea Gorgone (@KerryGorgone) of MarketingProfs (@MarketingProfs) features a variety of marketers and shares insights to make you smarter. 15. Social Media Marketing Podcast: Michael Stelzner (@Michael_Stelzner) interviews guests to talk about what works in the world of social media. 16. Marketing Over Coffee: John Wall (@JohnJWall) and Christopher Penn (@cspenn) record the show in a local coffee shop and discuss all things marketing. 17. Brand Newsroom: With these 20-minute podcasts, James Lush (@lushjames), Nic Hayes (@Nic_Hayes) and Sarah Mitchell (@globalcopywrite) offer communication advice with a focus on brand journalism and content marketing. 18. The Marketing Book Podcast: Douglas Burdett (@ArtilleryMarket) interviews authors for their take on the best marketing tips and insights into the ever changing marketing landscape. 20. The Rethink Marketing Podcast: Act-On Software (@ActOnSoftware) interviews marketers who have rethought their marketing approach with tips that all of us can use. This is only a handful of the marketing podcasts out there. What podcasts are you listening to? Tell us in the comments below. Thanks for sharing this useful information. I was looking for this type of blog so thank you for sharing this information with us. A podcast is a specialized device that has been perceived for its online business showcasing capacity. Podcasting, when used viably, can advance online organizations in various ways. Figure out how podcasting can be utilized as a capable business advertising instrument on the web. Digital marketing is a base these day for those people who want to explore their business online.Either your business is of franchise or textie , i am blogger who wrote about digital marketing and topics related to this like SEO , SEM , Advertising and more . so if anyone like to read such type of topic they are most welcome. Thanks for including us Jeremy! Thanks so much for including MarketingProfs! You need your income to come automatically so that you can use the precious little time you have to produce more streams of income that will pay you on autopilot. Most of the time you will find medical transcription jobs that pays you well. Telemarketers can make, on average, $16.08 per hour To find this sort of work, you can simply search through job sites such as Upwork , Glassdoor , Monster , Indeed or FlexJobs Type in telemarketing” or telemarketing” into the search box with your specific parameters. Consider testing websites from your home as a part-time side hustle. This is an ideal program for somebody like me who had no previous experience with structure and marketing a site. Digital Marketing Manager Responsibilities. Planning digital marketing campaigns, including web, SEO/SEM, email, social media and display advertising. Maintaining our social media presence across all digital channels. Measuring and reporting on the performance of all digital marketing campaigns. This style is unbelievable! You certainly understand ways to keep a reader entertained. In between your wit and your videos, I was almost transferred to. begin my own blog (well, almost ... HaHa!) Great job. I really enjoyed what you needed to state, and more than that, how. you provided it. Too cool! Quit 9 To 5 Academy Review is an amazing website where you get to work and learn with the professionals and then start your business in the platform of Facebook. The Probiotic supplement helps to balance good bacteria and in this regard, Probiotic t-50 review is creating buzz. How far is the supplement reliable and worth considering, you will come to know about it here.